DISCOVER THE LIFE-CHANGING MAGIC OF LISTS IN THIS INTERNATIONAL BESTSELLERThe humble list has the power to change your life. In its immediacy, its simplicity and its concise, contained form, the list enables us to organise, to save time and to approach facts with clarity. Yet why do we end up with interminable To Do Lists that are never completed?After decades living in Japan, Dominique Loreau has… become a master in the art of de-cluttering and simplifying. 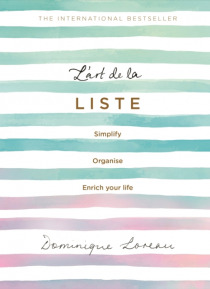 Now, in L'art de la Liste - a huge bestseller in her native France and translated into English for the first time - she turns her attentions to better list-making, showing you how to organise them and use them intelligently. Taking you on a step-by-step journey to greater productivity, this practical, inspiring book influences every aspect of your life - from home, diet and beauty to mental health and self-awareness.To perfect the art of the list is to live simpler, richer and more organised lives.